A cat lounging by the window at Cat Cafe MoCHA. That’s what happened this past Sunday during a relaxing day out on the town. After checking out a delicious Vietnamese restaurant for lunch, we’d decided that we’d have a drink at a cafe before parting ways. Ikebukuro had different plans for us. While wandering around the West Gate area of Ikebukuro Station, we both spotted a sign for a cat cafe. 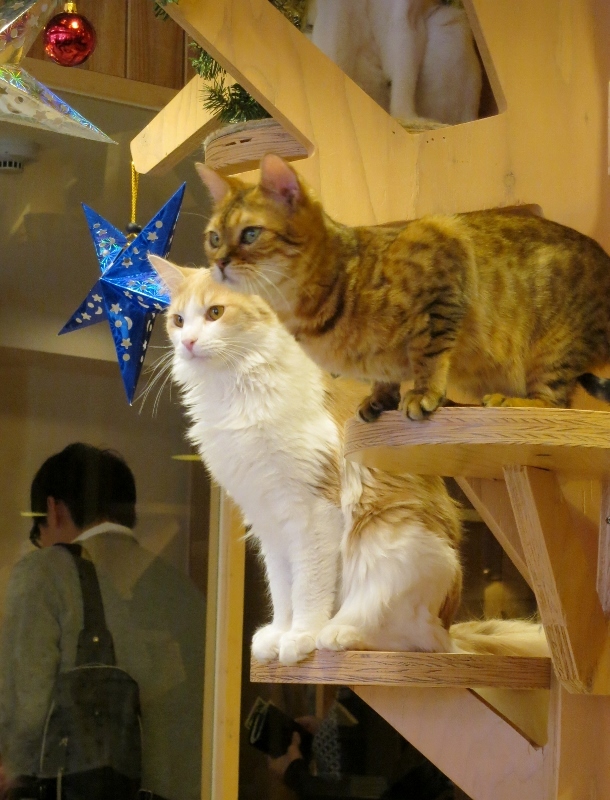 Ikebukuro has several established cat cafes on the east side, but this one appeared to be newer. 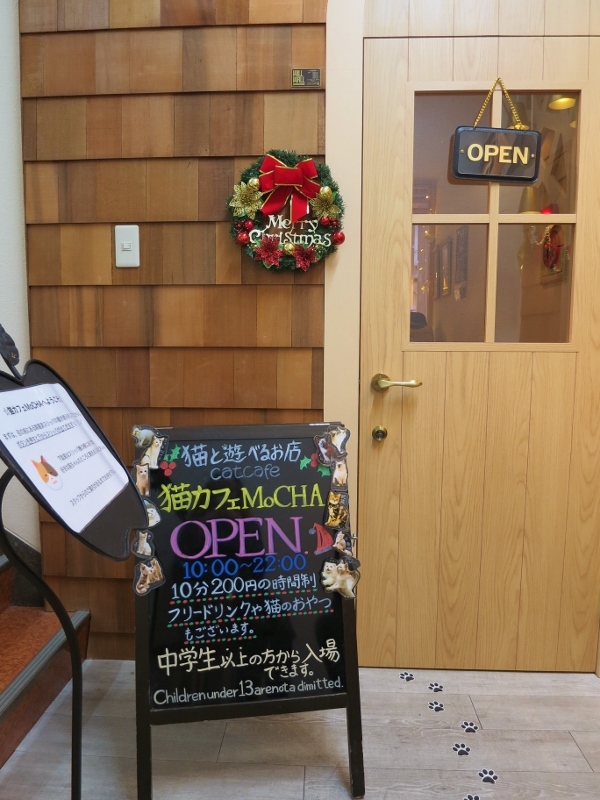 A quick look at the cafe’s website showed that MoCHA Cat Cafe had opened in February 2015. The fluffy white kitty on the sign of MoCHA Cat Cafe was argument enough for dropping the cup of coffee idea and heading up to the 3rd floor for some quality cat-petting time. When we got to the third floor of the building, we were greeted by cheery Christmas-themed decor, complete with wreath. As with most cat cafes, after entered, we traded in our shoes for slippers, sprayed our hands with disinfectant and signed in. We were given a check-in slip detailing when we entered. 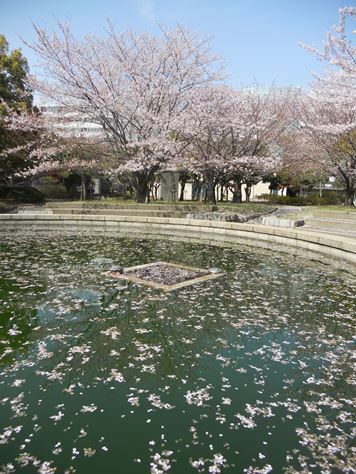 Then, we free to enter. At first, a fluffy white cat “blocked” our way, seemingly ready to dart out as soon as we opened the door. However, the staff went ahead and ushered us in — the cat didn’t bolt for it. Later on, we were to see why the cats would be eager for new visitors. The cats mill around the cat tree at MoCHA Cat Cafe. 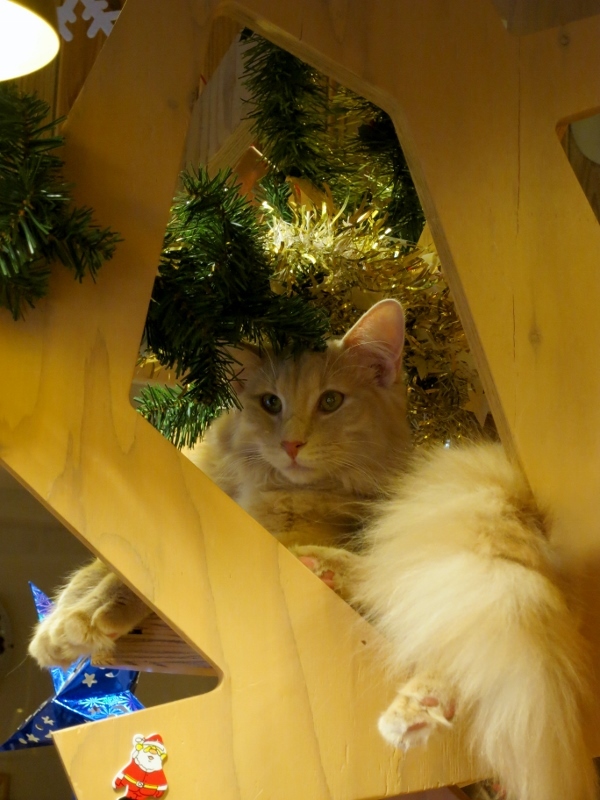 As we took our seats around the centerpiece, a huge cat tree, we noticed cats seemed to fill every nook and cranny. Even above us, a cat took a stroll along the strategically placed cat steps. Every now and then, we would reach out and pet a nearby cat. The cats took it very well, although most didn’t seem interested in petting. Cats in every nook and cranny. As we watched a staff member lay out a blanket, we soon figured out what attracted cats to new visitors: treat time. 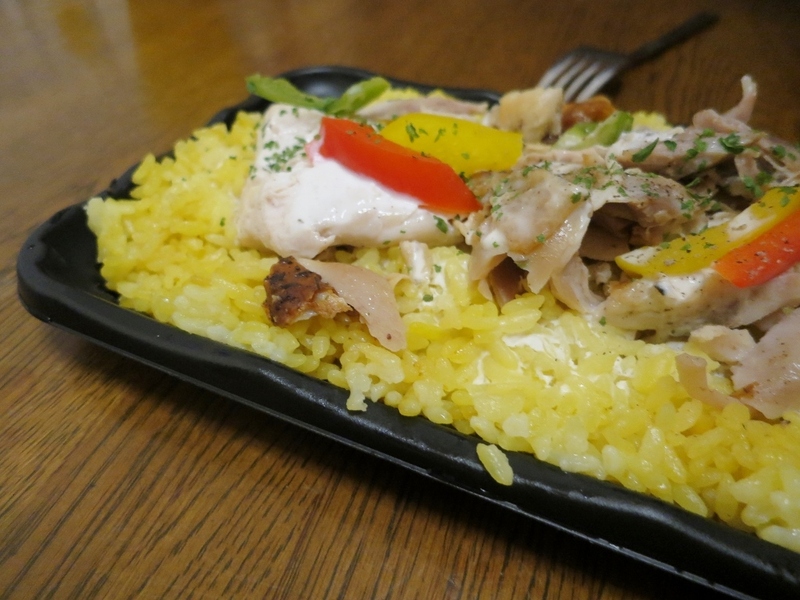 A younger visitor had bought what appeared to be a bowl of tuna. We were in for a spectacle. The visitor was instructed to feed the cats who were on the blankets, probably to keep mess to a minimum in the oddly shaped cafe. Waiting patiently for their turn for food. A few cats had already gathered around, likely tipped off by the blanket. Once the bestower-of-food began feeding the first few cats with a wooden spoonful of tuna, cats seemed to pour out of nowhere for a bite. The cat food feeding frenzy lasted a reasonably long time and helped me determine who my favorite cat was. A small off-white kitty hung back around the cat tree, obviously wanting a bite but not aggressive enough to go for it like some of the larger cats. Not to mention that her tongue was perpetually sticking out. 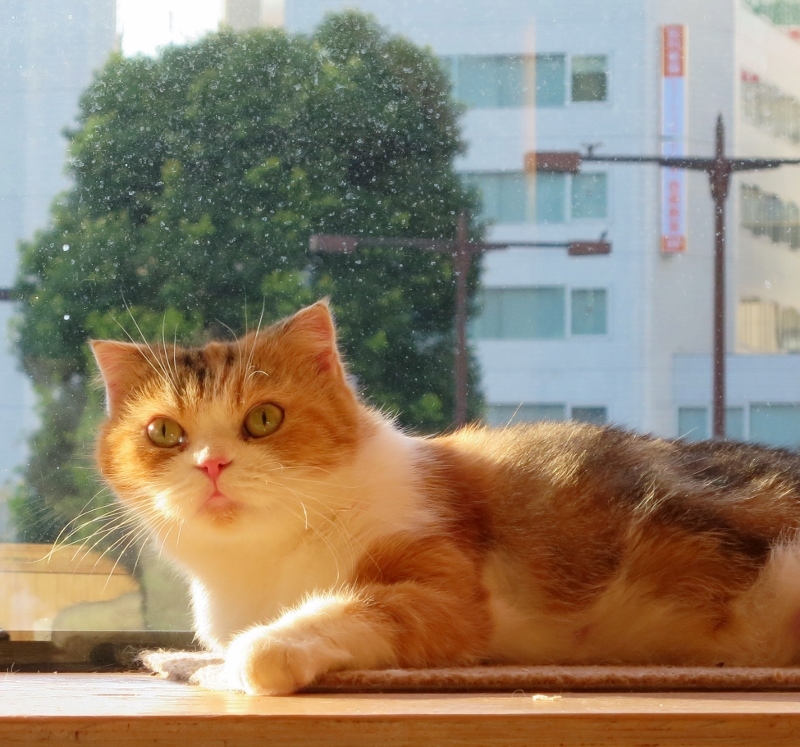 A quick consultation of the MoCHA Cat Cafe “cat staff” book told me that this was likely Kurumi, a female Scottish Fold. 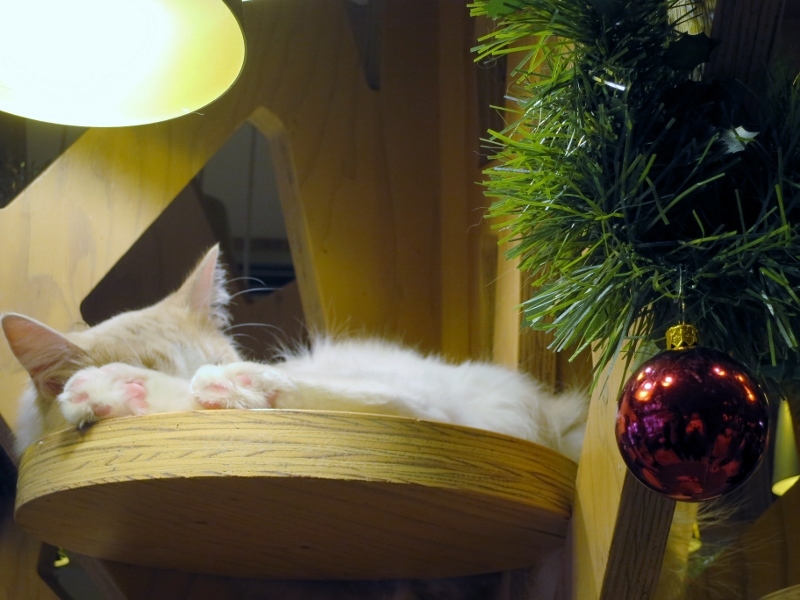 After the furor was over, Kurumi would fall asleep underneath the cat tree, all the while in her Santa suit. After the cat feeding had ended, most of the cats dispersed, which gave us a good reason to explore more of the small Cat Cafe MoCHA. 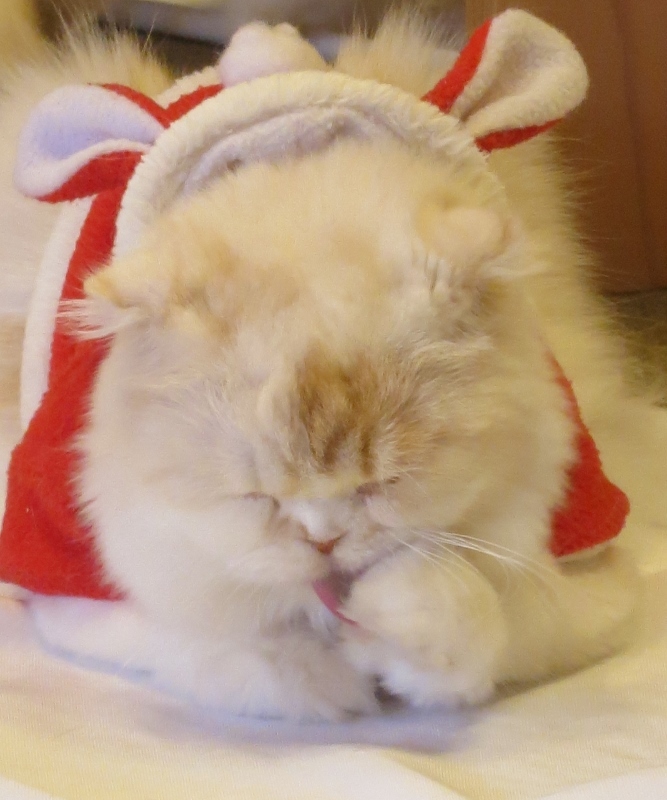 Several cats roamed around in Santa and reindeer costumes, but most were falling asleep in various parts of the cafe. 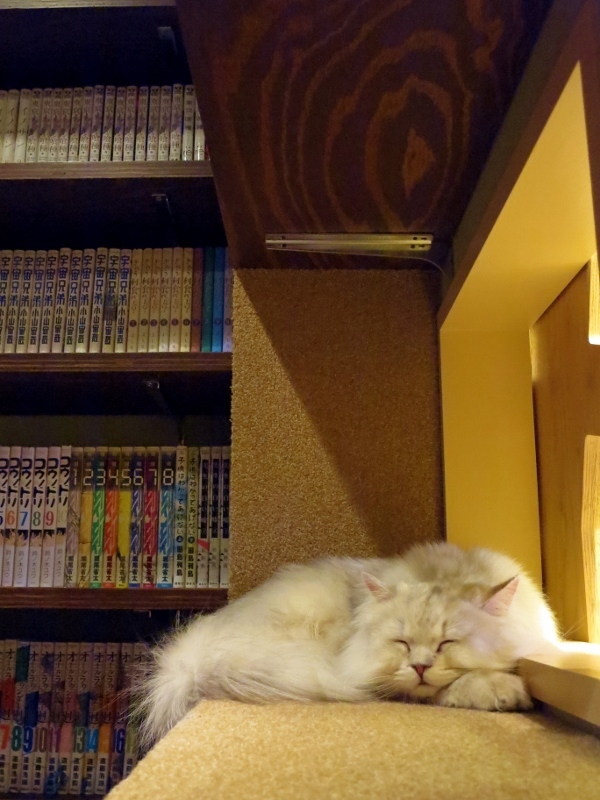 In addition to a sitting area around the cat tree, the Cat Cafe MoCHA had two couch areas and a manga corner, which housed popular manga series such as One Piece and Thermae Romae. Outside, there was an all-you-can-drink bar for those who ordered that option. Most people amused themselves by sipping on their drinks while taking photos of cats with friends. As we didn’t want to run up a huge bill, we left after about 30 minutes. It turned out that it had been my cat-cafe partner’s first time at a cat cafe. While the cats themselves weren’t particularly cuddly (at many cat cafes, this is the case), the cafe itself was the most stylish I’ve been in and probably has the prettiest cats. 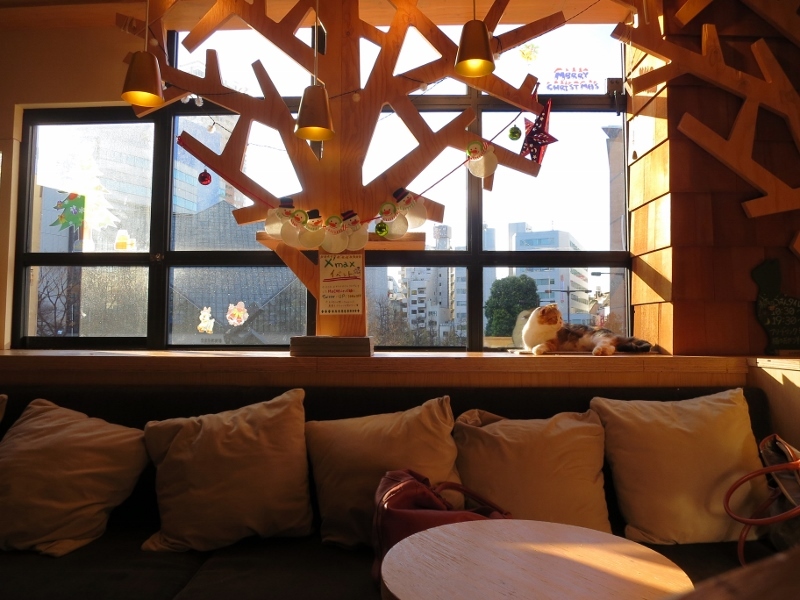 MoCHA Cat Cafe, with its beautiful cats and atmosphere, is a good first cat-cafe experience. When you enter, you will take off your shoes and put them in the shoe-keeping box. You will take slippers out of the slipper box and go up to the counter. The staff will explain the rules and ask if you wish to add the all-you-can-drink option. You take your slip (which has your start time printed on it) and go inside the cat cafe area. 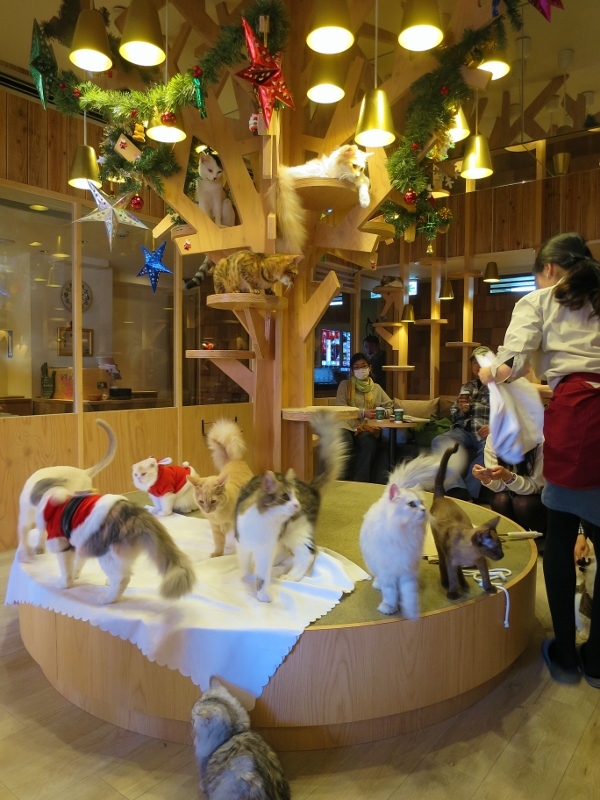 MoCHA Cat Cafe has a pay-as-you-leave system. You will need to pay attention to the passage of time (start time is printed on your slip as you go in), as the staff will not notify you about how much time has passed. 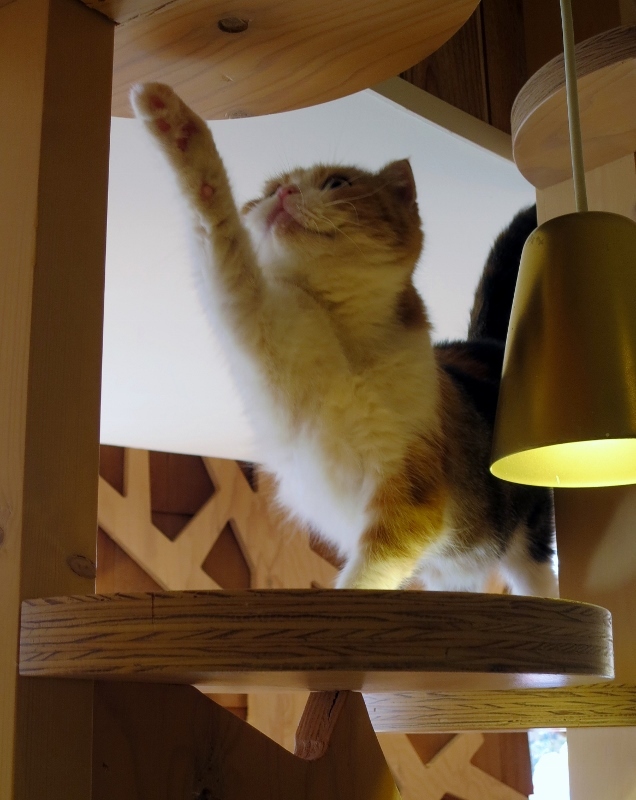 The MoCHA Cat Cafe website states that it does have English service. The below prices are based on the English version of the Cat Cafe MoCHA website. Please see the official website for the most up-to-date prices. Feeding time at 10:30am and 7:30pm. Treats may be given between 11:00am and 6:00pm. Comparatively crowded between 2:00pm and 5:00pm. Cats below 1 years old rest after 8:00pm. *Please note only middle school students and above may enter. Have you been to the MoCHA Cat Cafe?